A woman was taken to an area hospital after hitting a pole and then crashing into an Antioch home. 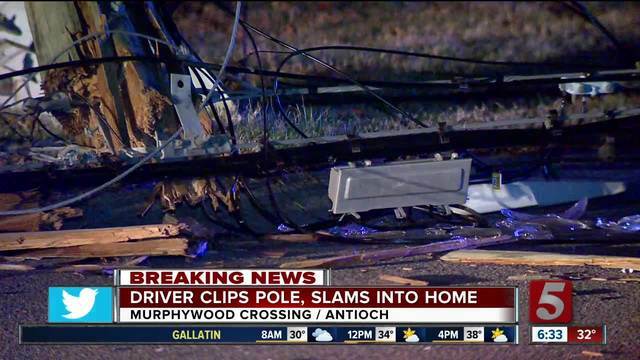 Officials with Metro Nashville Police said the driver hit a utility pole and mowed down a fence,before continuing down Asheford Trace and hitting a home at the corner of Murphywood Crossing. The incident happened around 12:30 a.m. Thursday. Police said the area is residential with a speed limit of only 30 mph. The woman suffered minor injuries and was taken to an area hospital. The side of the home was lightly damaged in the collision. Homeowner Jonathan Humphreville said he was awake when it all happened. “It was extremely jarring to feel that and unfortunately common, because it's happened two other times in the last year,” he said. A Nashville Electric Service employee came out to the scene to check the extent of the damage.